As part of the Collections Care Project we are sharing unusual finds from our decorative arts collection. These colorful, seemingly decorative glass balls are an unexpected relic from a once popular sport. Trap shooting began in England in the mid-1700s as an expansion of bird hunting, and a way to practice for the sport. The challenge of using live birds was mitigated by glass shooting targets, the antecedent to the clay targets, or clay pigeons, which are more familiar today. In 1866 Charles Portlock of Boston introduced America to glass targets imported from England. 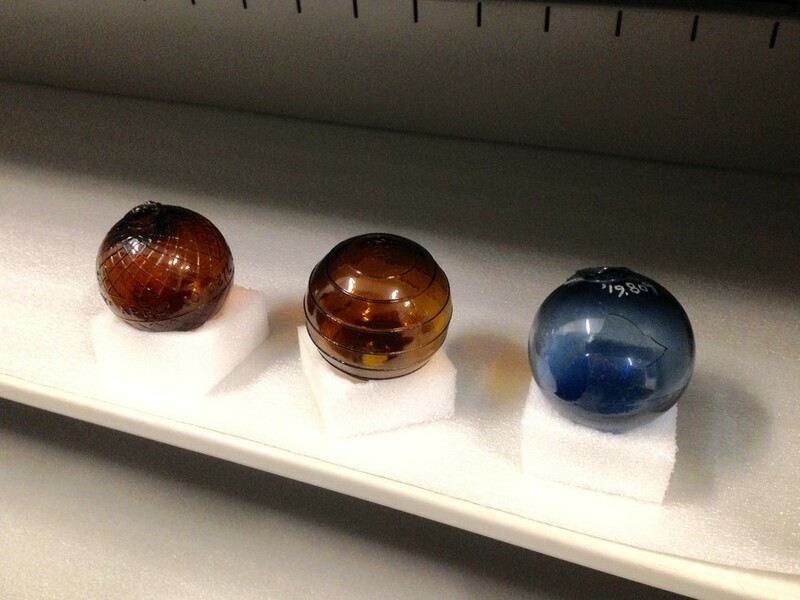 They were hand-blown, molded glass balls approximately 2.5 inches in diameter. They were easy to manufacture, inexpensive, and could be purchased by the barrel, $1.00 for 100. The first shooting competitions involving glass targets began in the Boston area in 1867. The targets could be filled with feathers, powder, or even ribbon that would explode out of the target when struck. Target shooting competitions involved two participants or a single competitor attempting to break as many targets as possible over a set amount of time. The first clay pigeon was invented by George Ligowsky in 1880. Clay pigeons were adopted quickly and replaced glass targets in competitions, but glass targets remained in the exhibition shooting realm of Wild West shows and were preferred by Buffalo Bill Cody and Annie Oakley. They continued to be made into the 1920s. Visit our Collections Access database to find more fascinating objects like these. Help ensure their preservation by donating to the Collections and Conservation Fund.